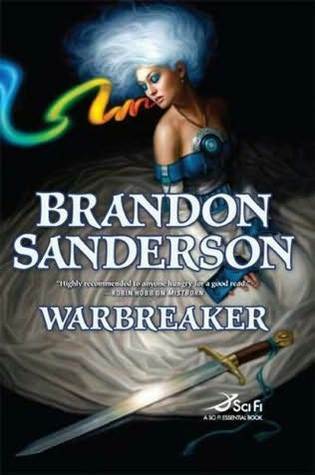 What a colorful world Brandon Sanderson crafted in Warbreaker! This is seemingly the tale of two radically different sisters. Vivenna, the oldest of her siblings is traditional, poised and raised to be the perfect bride to the powerful and fearsome God King, in order to maintain peace between their two kingdoms. And then, there is Siri, the youngest princess, bold, rebellious, curious, full of life and “unimportant”. Their lives are turned upside down when their father decides to send Siri to Hallandren to marry Susberon, the God King, instead of Vivenna. But this is also a tale of self-discovery, sacrifice, religion, bravery and redemption. I really enjoyed Warbreaker, again so much different from anything I’ve read before. Brandon Sanderson is such a fascinating storyteller! He has a vivid imagination and an inimitable skill to weave stories with various and complex characters evolving in new, independent worlds (even though this book is part of the ambitious Cosmere). My life to yours, my Breath becomes yours. A particularity of Sanderson’s books is his talent at creating amazing magic systems, intricate and yet easy to understand. They have clear instructions, rules and restrictions; which is refreshing and very different from most classical fantasy works where the magician/wizard/sorcerer mutters some incantation in an unfathomable language and waves his hands/wand/whatever and things just happen. In Warbreaker, the magic system is original, again!, and quite amazing. But what’s even more fascinating is that all the magics Sanderson created within the Cosmere obey, in an almost scientific approach, to the same set of rules : Investiture, source of power, gain/loss/balance (you can check this excellent post to learn more about the Cosmere’s magic systems) while having their own touch and individuality. But beyond the originality and uniqueness of Sanderson’s magics and worlds, I don’t think his work would be as popular and engaging without his brilliant characterization. Warbreaker was no exception. One of my favorite characters was Lightsong, the Returned god of bravery, who didn’t believe in his own godhood and put a lot of effort in being useless, and yet, found himself entangled in twisted political schemes. His only flaw was his pointless interactions with the tiresome and vain Blushweaver. Siri was extremely likable and while I didn’t care much about Vivenna (some of her POVs were so long they were almost painful! ), her story became pretty interesting halfway through. The two mercenaries added of lot of fun to the read without being caricatural. And Vasher and Nightblood were, oh so intriguing! While the sword’s intentions were very clear all along the book, Vasher was very difficult to judge and I really need to know more about his past!! Overall, Warbreaker was a fun read and a different kind of fantasy, with a major focus on the characters’ development and interactions. Don’t go into it expecting a lot of actions and magic battles! In fact, the pacing was globally slow but built up cleverly to a thrilling last quarter, as usual! I still need to try Brandon Sanderson one of these days, I like that this is character- focused as I seem to gravitate towards that kind of fantasy these days. And his books are huge! At some point I need to pick a series and go for it! Thank you for your nice comment, Greg! Sanderson is a master of character-driven books! I hope you enjoy them. His best work, in my opinion, is the Stormlight Archive, with a huge focus on characters and their slow but oh so satisfying, development!